Come to RJF Motorhomes and you can select from a truly prestigious range of American RVs, trailers and fifth wheels available for hire. Every model offers outstanding levels of luxury, comfort and specification, so that your stay however long or short will be as relaxing and stress-free as you could want. 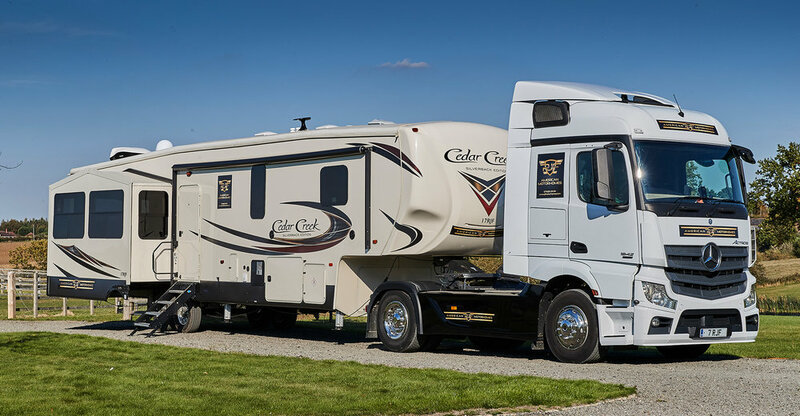 Our fleet of superb American motorhomes is extensive so we are sure to have the trailer that is perfect for your requirements, whether you want something big or small, a coach or fifth wheel. We have a vehicle to fit in with your budget. Our fleet is constantly being updated too, so you will normally be able to hire the very latest model. Please note that none of our motorhomes are available for self-drive hire. Press the play arrow and take a virtual tour around the motorhome. You can move quickly from room to room by clicking on the floor circles. Use your mouse to look left, right, up and down. The blue circles will tell you what's inside. Press the play arrow and take a virtual tour around the RV. You can move quickly from room to room by clicking on the floor circles. Use your mouse to look left, right, up and down. The blue circles will tell you what's inside.